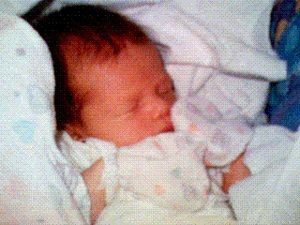 A baby girl and the camera phone were born 20 years ago | News | Fullpower Technologies, Inc.
Twenty years ago Sunday, Philippe and Sonya Kahn spent 18 hours at a hospital in Santa Cruz, waiting for their baby Sophie to be born. Like nearly all expectant fathers, Philippe Kahn planned to take a picture of the new baby but, instead of waiting till he got home to distribute the photo to friends online, he wanted to do it directly from the hospital. But that was in 1997 when there were no camera phones. So he invented one. Kahn, who previously founded Borland International and Starfish Software, had already configured a home server to store images, automatically notify friends about new images and send them a link so they could view them via the web. But there was no way to get the pictures to the server directly from a camera. Philippe Kahn took the first ever cell phone picture of his then-newborn daughter Sophie in Santa Cruz County. Kahn had a Casio QV-10, the first consumer-grade digital camera with an LCD display that, he said, “made pixelated but nice 320 by 240 pictures.” He also had a Motorola StarTAC “flip” phone, so during Sonia’s 18 hours of labor, he thought about finding a way to connect the two so he could upload a picture of the baby directly from the hospital. “It was clear that I had a hardware problem. Short of taking the phone apart I needed to interface with the phone,” he said in an interview. He also needed to connect a laptop to control the camera/phone connection. Phones then couldn’t connect to either laptops or cameras but – as he pondered the problem – he remembered he had a StarTAC speaker phone kit in his car which, of course, could connect to the phone. With his wife’s blessing, he “literally ran down to my car, took out the whole speaker phone kit and started working frantically at creating a software/firmware/hardware interface” that enabled him to send the pictures from the laptop, which was connected to both the camera and the phone. As luck would have it, he finished this Rube Goldberg device just in time for the arrival of Sophie and snapped what was not only Sophie’s first picture, but the first picture taken by what eventually evolved into the camera phone. Kahn’s server sent links to this image to friends, family and colleagues and he started hearing from people who were impressed at how quickly he got this picture from the hospital to their screens, which made him realize he had a potential product. “Immediately it became clear that we needed a CMOS (complementary metal–oxide–semiconductor) sensor and a micro controller unit integrated in phones. So we built these prototypes that were interfaced with the exact software/server/service-infrastructure,” he said. With a prototype in hand, Kahn tried to convince the CEOs of Kodak and Polaroid to create an integrated phone and camera “but none of them could imagine that the phone would be the integrating device.” He said that they “hired consultants, market pundits and they all collectively came to the conclusion that phones would be focused on voice and that cameras would become wireless.” Both Kodak and Polaroid later went bankrupt. “They totally missed the paradigm shift,” said Kahn. Unable to find a partner in the U.S., Kahn took his idea to Japan but had no success with big players like NTT Docomo. But he did find interest from a small carrier called J-Phone, which, in 1999 partnered with Sharp along with Kahn’s company LightSurf, to design a “Picture-Mail phone.” In 2002 Kahn’s company worked with Sprint and Casio on the first U.S. camera phone. Sprint loaned me one of those first phones to review. I picked it up at their office on Wilshire Boulevard in Los Angeles and, after leaving the office, I found a parking ticket on my car. Convinced that it was an unjust ticket, I used the phone to document my surroundings to prove why I shouldn’t have to pay the fine. The Los Angeles Parking Citations Bureau disagreed and I didn’t bother to appeal, but it nevertheless convinced me of the power of always having a camera in your pocket. Today, I routinely use my camera phone to help me remember where I park my car. I take pictures of luggage tags, receipts and the price tags of items I’m thinking of buying. Of course, like most people, I also use my phone to photograph people, animals and scenery. Truth be told, the pictures I take with my smartphone often look just as good as the ones I take with my $1,000 camera. Kahn’s current company, Santa Cruz-based Fullpower, develops cloud-based technology to power sleep tracking, analog smartwatches and other “Internet of Things” products. Both my kids were born before Kahn built that camera phone so I wasn’t able to use a phone to transmit pictures of my kids’ births in near real time. But millions of fathers have since instantly shared pictures of their newborns to loved ones far and near. Happy 20th birthday to both the camera phone and Sophie Kahn.